Introducing playground games for kids encourages participation in outdoor games that typically requires just a pair of legs and the ability to follow some basic rules. Ready, set, go! Here are some playground games for kids that will get them energized and engaged in physical activity. Red rover is a classic playground game for kids where two groups face each other in a line, holding hands. One group decides together the name of the person they want to call over, yelling out, "Red rover, red recover, send (person's name) right over." That kid now has to run as fast as possible to break the grip of the opposing team. If he can't get through, he must become a part of the team by joining hands. If the person does break though, he can take one person from the opposing team to come join hands on his team. In the end, one team will include all the kids, which means that everyone is the winner. In this game, one person stands in front of the group and calls out different actions for the kids to do using the phrase "Simon says" before each action. This could be anything from "Simon says touch your toes" to "Simon says jump ten times." The longer the game is played, the quicker the actions should be commanded. If the phrase "Simon says" is omitted, everyone should ignore the command, but inevitably many kids will forget or do it automatically. Those participants now have to wait out for the game to be over. The last person standing is Simon on the next round. 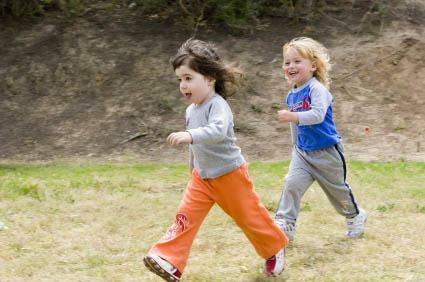 Freeze tag: You freeze after being tagged until someone runs under your legs and "frees" you. TV tag: You freeze after being tagged until another player tags you. To become unfrozen you then have to yell out the name of a TV show. If someone else has already yelled out this show, you're "it." This game can be done at a playground that has places where you can hide, but parameters should be set for how far away and where you can hide. This game should also be played in a safe location. One person will close his eyes and count down, while the others must run and hide. The first person who is found, now has to be the seeker. Another variation is to have a home base where each player must get to before being tagged, otherwise a player is not "it." No matter what games your kids enjoy at the playground, remember to teach them about staying safe. Things like always having a buddy, knowing how to call for help, and basic knowledge for using playground equipment should be discussed. Also, use caution when playing with younger kids so that no one gets hurt. Above all, encourage your kids to be wise, but to also go out and have fun in the outdoors.